Horses and flying both fascinate me. Small wonder, then, that wild winged horses known as wingabeasts feature in Tales of Faeraven. In DawnSinger, book one of my epic fantasy trilogy, the hero and heroine undertake a perilous journey on the back of wingabeasts. I want to give the reader a chance to fly. The wingabeasts of Faeraven are based on Pegasus, the winged horse of Greek mythology. While Pegasus is large and white, as befitting the carrier of thunder on Mount Olympus, wingabeasts come in a variety of colors: silver, gray, black, and gold among them. They also vary in size from delicate to brawny. The smaller wingabeasts have more agility. Pegasus is said to be the son of Poseidon and Gorgona Medusa and sprang, according to differing accounts, from drops of blood or blood mixed with dirt or blood and sea foam after his mother was decapitated by Perseus. Pegasus struck the ground with his hoof to create the stream Hippocrene in the Helicon Mountains, a place poets drink the water to spark their creativity. The wingabeasts of Faeraven ran wild in the Maegrad Paesad (Impassible Mountains) until Talan, one of the High King’s of Faeraven, captured one in a memorable ride forever immortalized in the history of his people. After that more wingabeasts were captured, but an untamed remnant retreated beyond reach. The Guardians of Rivenn received the privilege of riding the captured wingabeasts. The creatures’ respond both to touch and sound commands, and will hold still when instructed, even when predators are near. When danger threatens and their riders are not present, as a safety measure, wingabeasts will launch into flight, but later return. In the Middle Ages, the time period the world of Elderland within Tales of Faeraven is based upon, the winged horse symbolized virtue and wisdom. In DawnSinger, the wingabeasts certainly help those who ride them to that end. 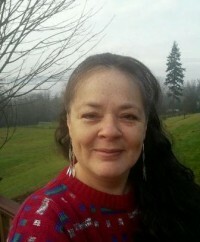 You can find out more about Janalyn and her books on her website or blog. This entry was posted in Christian Fantasy, Mythic Creatures and tagged Janalyn Voigt. Bookmark the permalink. Hi, Sarah. 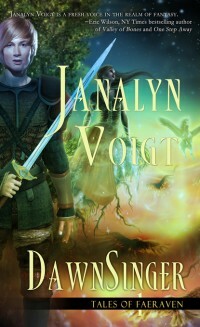 Thanks for tweaking your blog schedule to host for DawnSinger’s blog tour. I love your site, especially the banner. Did you design it? I appreciate the time you took in writing a guest post. I enjoyed learning how creatures in your world connect to the mythic creatures of old! This book sounds very interesting!! Horses in any shape, size and color fascinate me. I’d like to to be entered in the giveaway please! I’d love to win a copy for my sister. She loves fantasy. Thanks for the opportunity! Wow, cool post! I love horses and their mystical fellows. Thanks! I’ve long wanted to read DawnSinger but got sidetracked. So, I forgot to add it to my Amazon wishlist. Think I’ll head on over there to add it in a moment. Thank you for hosting Ms. Voigt here today. I love the way her mind thinks. So much creativity and inspiration! I’d love to win a paperback copy! I’d love to win this! 🙂 Thanks, Janalyn, for putting up this drawing! Thanks for the entertaining post and book promotion! I’d love to receive a free copy. You’re all most welcome. I enjoyed writing the post and can’t wait to find out who wins. I agree that the banner is stunning. Janalyn, I’d love to read this book. I enjoyed the review. Your world of Elderland sounds well thought out and researched, with a depth I know I’ll enjoy. Wingabeasts! I love the name. Please enter me in the giveaway. You’re welcome, Sarah. I was happy to do it. Thanks again for introducing me to your readers, Sarah. Nice post. I used to be checking continually this site and I am fascinated! Helpful information and facts specifically the remainder of the area 🙂 My partner and i manage these kinds of info considerably. I became trying to get this unique facts for any quite long time frame.. Máy ?o huy?t áp Many thanks and finest regarding good luck.